Lewis Franklin Wright was born in Jefferson County, Georgia December 4, 1848. He was the son of Caleb Alexander Wright (1814-1894) and Rachel (Lowery) Wright (1817-1864). Lewis came to Parker County in 1873 and was a prominent farmer for fourteen years on land purchased six miles northeast of Weatherford, Texas, a part of which was known as the Porter Ranch in 1986. Lewis also had a farm in Palo Pinto County for several years, while still maintaining a home in Weatherford where Mrs. Wright and their three children lived during the winter so that the children could attend school. Mr. Wright later opened a grocery store on North Main Street in 1893. It would seem that the land was deeded for the purpose of a church and a school and landmarks and local history verify that a good size settlement once existed and that a major road came in from the South to the North crossing an old swinging bridge, the evidence of said bridge still there. A long time resident of that section of the county, Miss Jessie Cummings, gave a personal account of the Wright Community in the early 1900’s. She verified a school, a church and cemetery. The transcript of her interview was lost in a fire of the Kemp home in 1983 and cannot be replaced. From a study of the Wright Cemetery, abandoned since the early 1900’s, we find documented proof of family of only one of the trustees being buried there. Two children of Mr. William Armstrong Erwin were buried there – in 1877 and 1889. Although Lewis Wright and his wife, Martha Eleanor (Green) are both buried in Weatherford at City Greenwood Cemetery, tombstones reveal that Lewis’ sister-in-law and her child are buried there – Juda F. Connell Wright, wife of Robert A. Wright and an infant of R. A. and Juda F. Wright both died the same day on December 14, 1876. The first documented grave in Wright Cemetery is that of the wife and daughter of R. A. Wright on December 14, 1876 and the last documented burial was that of Caswell Byas in 1915, he having been buried beside his wife, Tabitha (Standifer) Byas, who preceded him in death in 1892. The Ewton family has three identifying markers and were related to the Byas family Albin Ewton, buried in 1884, committed suicide and a copy from the newspaper reveals the circumstances. 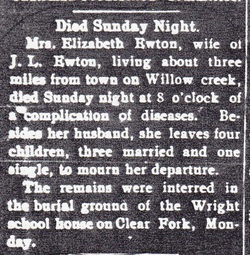 Also a newspaper clipping states that Mrs. Elizabeth Ewton, wife of J. L Ewton, died July 16, 1903 and is buried at “burial grounds of Wright School House on Clear Fork”. But there is not an identifying tombstone there. Other families with markers in the cemetery were Moughon, Freeman and Mitchell. All were in the same time period – 1870 to 1920. Conversation with old timers, Mr. Jim Ruland and William Odis Clark, reveal that members of the Hays family, including Bertha (Mullinax) Hays, are buried at Wright Cemetery in the early 1900’s as a result of small pox. They further stated that only three persons attended their service because of fear of small pox. However, this is unclear as Bertha Hays has a marker nearby in Clark Cemetery. Union Church Trustee William Armstrong Erwin, the son of James William Erwin Jr. and Sarah (Rodgers) Erwin, came to Parker County with his parents in 1850. He married Martha Elizabeth Stinnitt in 1860 in Parker County and they were the parents of 12 children. Two of those children are buried at Wright Cemetery, Martha Emma and Fannie Elizabeth. As of 1986 all that is left to mark the little community of Wright is an old cellar, an old grocery store type building and the cemetery. One would assume that the reason the cemetery was abandoned and most persons were then buried a short distance away in the Clark Cemetery, was that the cemetery became isolated after the swinging bridge was gone and probably impossible for the new motor vehicles to get to and even difficult for wagons. In March of 1986, V. E. Kemp, Jr., a great-great grandson of Caswell and Tabitha Byas, with the aid of an employee and Mr. Lowell Sullivan, Jr., contacted the landowner and the lessee of the ranch and began the cleaning and restoring of the cemetery. With power saws and literally hand-to-hand combat with the briars and trees. The cemetery was put back into mint condition - markers repaired, fences repaired, etc. The landowner and those with the land lease were very cooperative and agreed to help in order to keep the cemetery in a good state of repair. In 1910 Rev. Benjamin Franklin Fronabarger, pioneer educator and Baptist minister, and missionary Thomas Calvin Kuykendall, held a revival in a brush arbor on the Clear Fork. After the revival Friendship Baptist Church was founded. The Wright School House was used for church services the 3rd Sunday of each month by Rev. Fronabarger and Sunday school was held every Sunday. The Wright School House was originally located on the west side of the Clear Fork about 9 miles north of Weatherford but in 1923 it was relocated to the east side of the Clear Fork at Friendship Baptist Church’s present day location. More changes came in 1945 when the Wright school consolidated with Carter and Roberson Schools so the trustees decided to sell the building and land since it was no longer needed for classes. At the time Friendship Church did not have any Deacons so they appointed Mamie Woody, Eula Dill and Mrs. W. M. Woodle to raise money to buy the school. On December 1, 1947 the Wright School was paid for and Friendship was now a full time church. Friendship Baptist Church has been going strong for over 100 years now and the building itself has had several additions throughout the years as membership continues to grow. What happened to the original Union Church is not known? 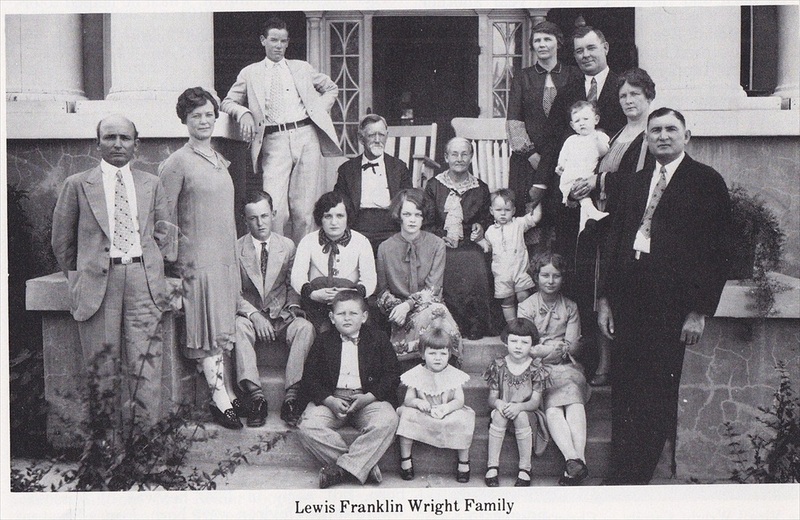 But we do know that from around the Civil War time and during Indian times, a group of pioneers called the Wright Community home and buried loved ones in the Wright Cemetery, so named for Lewis Franklin Wright in 1874. Today the same area is now known as the Friendship Community. Photos from History of Parker County & Kerry (Knox) Crawford.